The dwarf galaxy NGC 1140, spotted by the Hubble Space Telescope, is studded with new stars and harks back to the universe's first galaxies, bursting with activity and creating stars at the same rate as the Milky Way - about one new star a year. A wisp of a galaxy is rich with new, blue-white young stars and primordial gas in this new cosmic photo from the Hubble Space Telescope. The irregular dwarf galaxy is creating stars the size of our sun at a prodigious rate of about once a year. That's the same speed of star creation as our own Milky Way, but from a galaxy that is one-tenth the size. But alas, the celestial fireworks of NGC 1140 won't last forever. 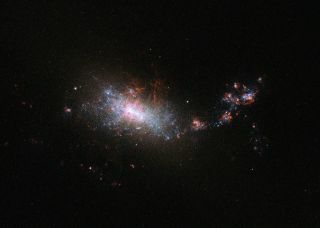 "The vigorous star formation will have a very destructive effect on this small dwarf galaxy in its future," European Space Agency officials wrote in an image description. As the galaxy's largest stars explode into supernovas, they will blow the star-creating gas away into space — "throwing out its potential for future stars," officials said. "NGC 1140's starburst cannot last for long."